The bead diameter of this type of Diamond Wire is 11.5mm, we can also supply 8.5mm to 11.0mm marble wire, it can be widely used on flexible marble quarrying, block shaping, cutting with superior efficiency. This type of marble wire is with high flexibility, therefore increase working lifetime, provide the different hardness of beads according to different stone type. According to the usage difference, at present wire saws are available for four major applications: quarries, for extracting raw blocks. Station block saws, for block trimming and cutting to slab. Profiling, for processing special shape, or curved slabs. Application on the multiwire machine, for cutting slab with high efficiency. 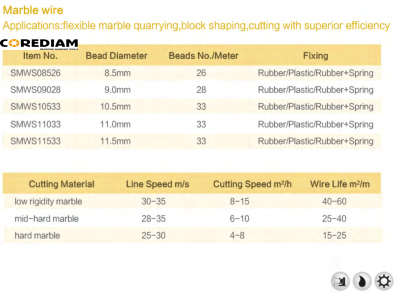 Looking for ideal Diamond Marble Wire Saw Manufacturer & supplier ? We have a wide selection at great prices to help you get creative. All the 11.5mm Diamond Wire for Marble are quality guaranteed. We are China Origin Factory of Diamond Marble Wire in 11.5mm Bead. If you have any question, please feel free to contact us.